Biocept, Inc., a leading commercial provider of liquid biopsy tests designed to provide physicians with clinically actionable information to improve the outcomes of patients diagnosed with cancer, announces the appointments of Scott Nicholson as Vice President of Sales – US and Cory Dunn as Vice President of Marketing. Scott Nicholson has 24 years of experience in the medical laboratory industry with a focus in oncology for the physician and hospital markets, and Dunn has over 15 years of commercial marketing experience in the life sciences industry, specializing in diagnostic testing services for oncology. 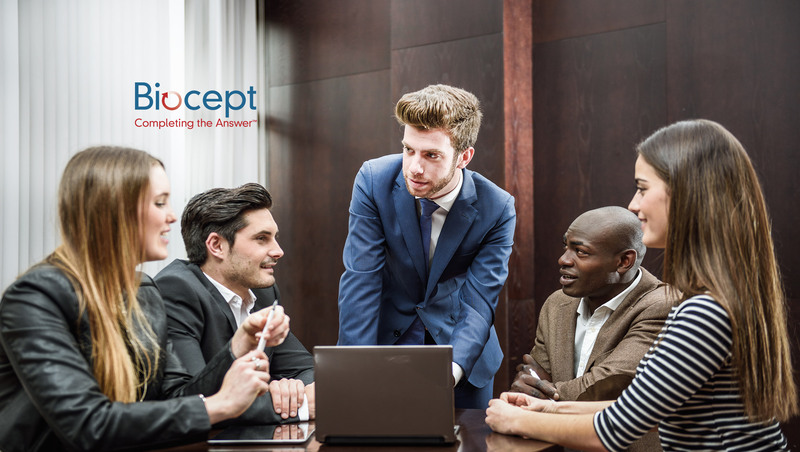 “I am pleased to announce the hiring of Cory and Scott, as we restructure and refocus the sales and marketing organization at Biocept,” said Edwin Hendrick, Senior Vice President, Chief Commercial Officer at Biocept. Scott Nicholson is a veteran sales executive in the medical lab industry with experience in the oncology segment. His previous positions ranged from Sales Executive, District Manager, and Regional Manager to Vice President of Sales and Senior Vice President of Sales. Nicholson was the first sales representative hired at US Labs, where he was instrumental in growing sales to approximately $80 million that led to the acquisition of the company by Lab Corp in 2005. He served as Vice President of Sales at PLUS Diagnostics for seven years and was instrumental in growing revenues from $2 million to nearly $100 million, before PLUS was acquired by Miraca Life Sciences in 2013. Most recently, Nicholson was Vice President of Sales at GenomeDx Biosciences, where he led the commercialization effort for the Decipher® genomic suite of tests in the urology market. Cory Dunn most recently served as Vice President of Commercial Marketing at GenomeDx, where she led the launch, commercial marketing, and product life-cycle management of the Decipher® genomic suite of tests for urologic cancers. Prior to GenomeDx, Dunn oversaw the marketing efforts for PLUS Diagnostics’ Gastroenterology, Dermatology and Hematology-Oncology product lines, which produced record growth rates and culminated in nearly $100 million in annual sales. Her past experience also includes serving as Marketing Director at Genoptix with key responsibilities for marketing Veridex’s CELLSEARCH® Circulating Tumor Cell Test, contributing to rapid growth and a successful IPO. Ms. Dunn holds postgraduate science and education degrees from the University of California, San Diego and Stanford University, respectively. In connection with the hiring of Nicholson and Dunn, Biocept granted each individual an inducement stock option award to purchase 24,200 shares of Biocept common stock. Each stock option was granted on 31 October 2018 in accordance with Biocept’s general practice.